A New Club Penguin Mission is A COUPLE MONTHS AWAY! WHA? Sorry, but we can't wait that long Club Penguin! THE NEW MISSION IS A COUPLE MONTHS AWAY! WHA? What do you think he's planning this time? Look for more mission news in a few weeks. In the meantime, you can practice your agent skills by doing the previous missions - and continue to keep the island safe. If you're not an agent yet, if your penguin is 30 days old, you can click the M at the top right of your screen. Then click the button that says: "Become a Secret Agent". You'll get to take a quiz to apply. Mimo Club Penguin Cave Haiku Contest FINAL Top 3 Finalists! Vote now for ONE on the poll at the left for the FINAL BIG WIENER! If you missed the contest you can read about it by clicking here. I will be your buddy on Club Penguin! I will follow you on Twitter! SERIOUSLY addicted to this game! 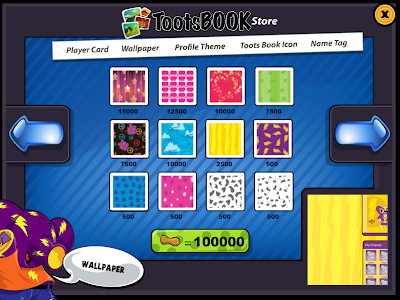 Tootsbook is like facebook, just for kids! Check it out! 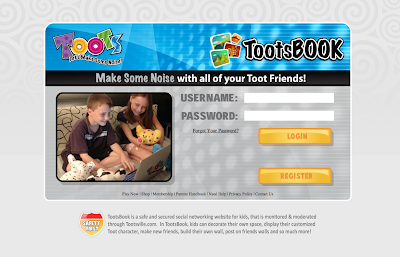 Tootsbook offers Safe Chat feature, so that you can chat with their friends AND IT'S SUPER SAFE. Tootsbook also has hundreds of ways to add personalization, so that the you can make pages all your own. 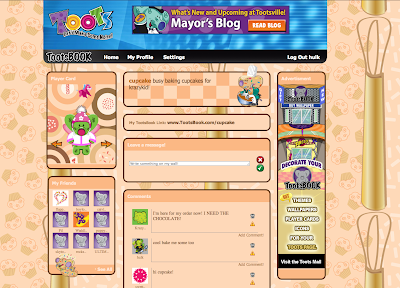 Tootsbook offers ways to connect with all of your friends from Tootsville and even buy things in the mall and decorate your own profile just the way you like it! Give it a TRY NOW! CLICK HERE! Here is how to find the new Club Penguin Wagon Pin cheat. Here is the new Pin Cheat! Step 2. Now go to the Ski Lodge. Step 3. Now click on the WAGON PIN! NOW YOU HAVE THE NEWEST CLUB PENGUIN PIN, WAGON PIN! But, wait, the old FEATHER PIN is still at the Beacon! Do you think Club Penguin will keep it up until the "Secrets of the Bamboo Forest" is over at the Stage? Try the game, Ninja Jump! 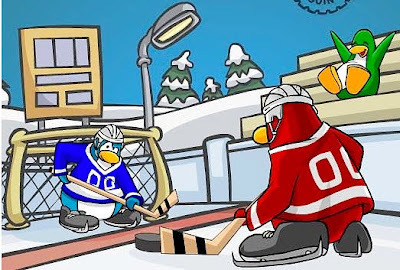 Here are the hidden items cheats in the new Club Penguin Snow and Sports Catalog. Step 1. Click on the Map in the lower left. Step 2. Click on "Ski Village." Step 3. Go into the Winter Sports Shop. Step 4. Now click on the catalog in the lower right. Here's how to find the new hidden Green Baseball Uniform cheat. Step 5. Click to the 1st page. Step 6. First click on the penguin in the background. Here is how you find the Red Ball Cap cheat. Step 7. Click on the 4th page of the catalog. Step 8. Click on the Pitchers Mound. It is official! 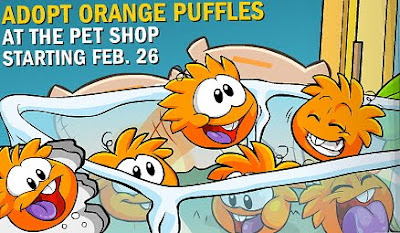 The orange puffle will be available later today! These adorable puffles are not shy. They like to play, dance and EAT! Maybe that explains the beaver teeth, huh? 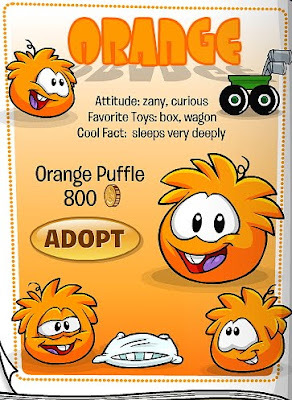 It is believed the orange puffle comes from the box dimension. Maybe that explains the purple tongue, huh? In other news, next week, there will be an update from Rory, the construction penguin, about the Underground, new formal fashions in the Penguin Style Catalog, and Rockhopper will arrive! Woot! I hope the Underground will be opening again soon, don't you? And, "formal fashions" sounds like the Penguin Play Awards will be here in March, too! Awesome! Let me know what you think about this new news! New addicting game! Escape from the Planet of Robot Monsters! Club Penguin Rockhopper Coming & New Reviewed By You! Woot! Rockhopper is on his way to Club Penguin! I wonder what the occasion is? 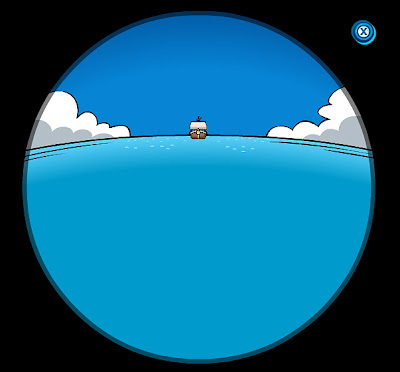 Usually Rockhopper comes to the island for a party or some other event. It has been a really long time since he arrived for no real reason. Hmm, could there be a surprise in store next week when he arrives? That would be awesome! "I play sports with all my buddies we do soccer,ice hockey,football, and sometimes basketball mostly our teams our red and blue but sometimes we go crazy using green and black. When we get tired we go to my igloo for some penguinade then jump right back up for some more." With Rockhopper arriving in Club Penguin next week, Club Penguin would like to know what are your favorite things to do when he's around? 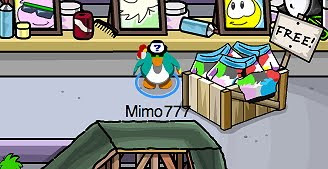 Do you like buying stuff from Rockhopper's Rare Items, playing Treasure Hunt, or something else? Be sure to let them know... and me too, k? The Puffle Party will be wrapping up on Thursday morning and Club Penguin will be launching the new Snow and Sport Catalog! 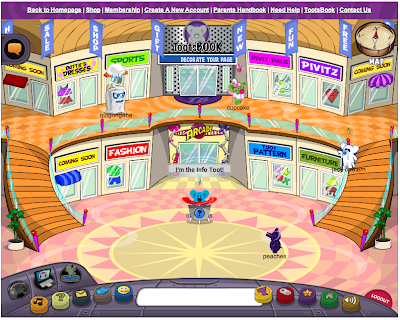 But, Club Penguin also says there will be a "surprise" at the Pet Shop, too! We all know what that is, don't we? ORANGE PUFFLE! Saweet! 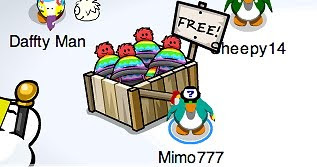 Last year we had to round up all the white puffles in Puffle Round up, so they would be available in the Pet Shop. 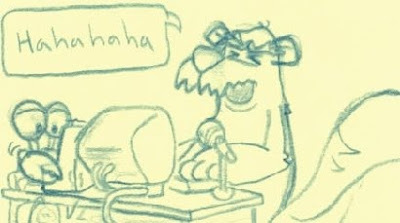 Hmm, now, this year, the orange puffle is just going to "appear" in the puffle catalog? Is that kinda weird, or is it just me? I was given this Special Club Penguin Toy - A Rockhopper Clip On that was never released on any toy site! It is still in the package! In a few days I will tell you how I got it! Have you ever seen one before? If so, let me know where. Do you have one? Maybe you got yours the same place I got mine... or maybe not! I just loaded A TON of new Flash games! Try them out! Can You Buy The Orange Puffle For Your Club Penguin? Maybe! WOW! So ya, take a look at the pet shop later this week. lol. What do you think? Do you think Billybob is giving a real hint or is he just teasing us? Thanks to Uilleam Beag, Braceface27, Fluffygood for the tip! 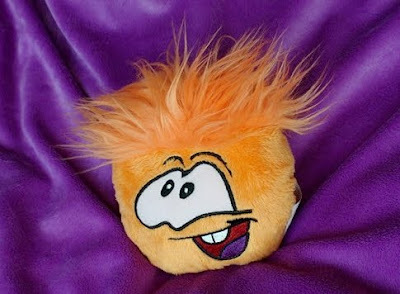 This orange puffle is part of the Series 4 puffles! In case you didn't know, the puffles do not have the same series numbers as the other Club Penguin toys. Speaking of that, the Club Penguin Limited Edition Series 7 plush toys and mix and match toys will be in Disney Stores, Toys "R" Us, and Target stores soon! Not really any new information for us, but pretty cool, huh? Check out all Club Penguin Toys here! Whoo hoo! Remember when I started the "Please move this" campaign? I said we needed to ask Billy Bob to fix the annoying language select menu that always covered the PLAY NOW button? If not, click here. Well, Club Penguin FIXED it! You now have to click on the Language Select menu and the language choices will drop down. If you do not select a language, the Language Select will pop back up as soon as you move your mouse! Sweet! 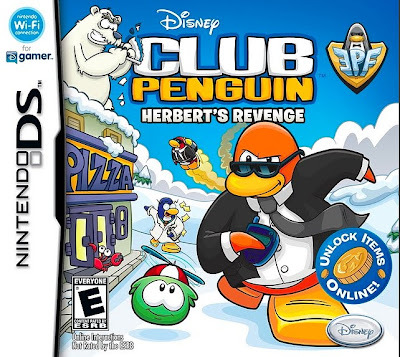 This Nintendo DS game should be available May 15th! Click here for more screen shots. Saweet! Once again Club Penguin is making penguins work together! 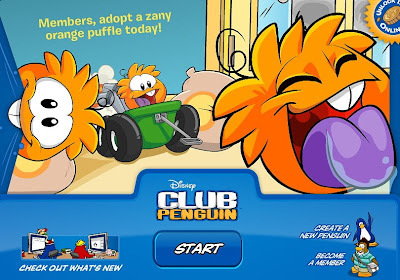 Remember when the newspaper said we should all turn orange and look for the puffle? Well, in order is spot the orange puffle around the island, you need at least 10 orange penguins! Let me know where all you find them! Woot! 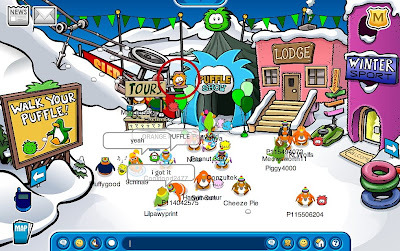 The Puffle Party is here! 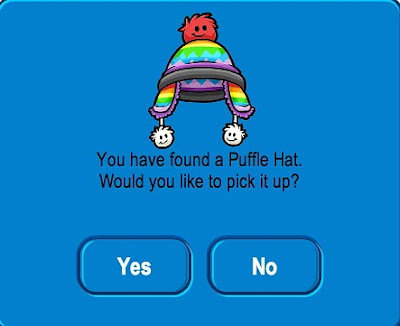 You now have the Puffle Hat! Whoo hoo, a NEW free item! Thanks, CP! 3. 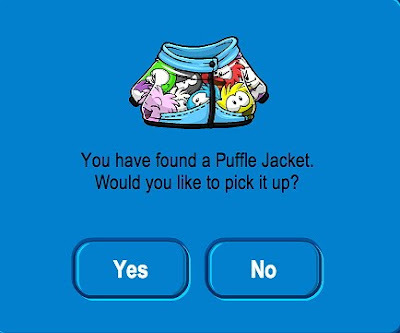 Go to the box that says "Free"
You now have the Puffle Jacket! Lots of fun at the Party! Let me know what your favorite room is!